Allow butter and eggs to stand at room temperature for 30 minutes. Meanwhile, line twenty 2-1/2-inch muffin cups with paper bake cups. In a medium bowl stir together flour, baking powder, baking soda, and salt. In a 2-cup glass measuring cup combine milk and limoncello; set aside. Preheat oven to 350 degrees F. In a large bowl beat butter with an electric mixer on medium to high speed for 30 seconds. Add sugar and lemon peel; beat until combined. Add eggs, one at a time, beating well after each addition. Alternately add flour mixture and milk mixture to butter mixture, beating on low speed after each addition just until combined. Bake about 18 minutes or until tops spring back when lightly touched. Cool cupcakes in muffin cups on wire racks for 5 minutes. Remove cupcakes from muffin cups. Cool completely on wire racks. 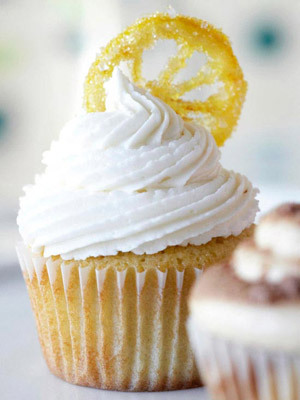 Up to 1 hour before serving, generously spread or pipe Lemon Frosting on each cupcake. Place crushed candies on a plate. Roll the edges of the cupcakes in crushed candies to coat. Or top cupcakes with a Glazed Lemon Slice. Makes 20 (2-1/2 inch) cupcakes. Allow butter to stand at room temperature for 30 minutes. In a large mixing bowl beat butter, shortening, and vanilla with an electric mixer on medium speed for 30 seconds. Slowly add 2 cups of the powdered sugar, beating well. Add lemon juice. Gradually beat in the remaining powdered sugar. Beat in milk, 1 teaspoon at a time, until frosting reaches spreading consistency.